This week and next I will highlight two collaborations of actor John Payne, director Phil Karlson and producer Edward Small, who had an impressive run of modestly-budgeted, high quality films in the years after World War II, a period when many movies merged elements of film noir with the traditions of the gangster melodrama (See for example my previous recommendation, I Walk Alone). This week’s recommendation is the first of their collaborations: 1952’s Kansas City Confidential. At one level, this is a superb heist film (which allegedly influenced Quentin Tarantino’s conception of Reservoir Dogs). A masked criminal mastermind half-recruits, half-bullies three lowlifes into pulling off an armed robbery. All of them wear masks and thus are unknown both to the police and to each other. The mastermind instructs them to hide out until the money is laundered, and gives them a secret method of identifying each other when the time is ripe for the payout. 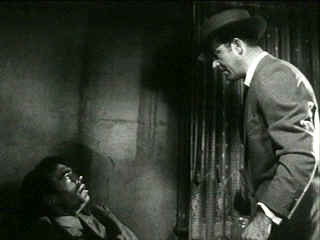 Meanwhile, an ex-con, ex-GI (Payne, playing two noir archetypes in one!) who was at the wrong place at the wrong time gets pinched by the police. He escapes their clutches and decides to pursue the gang, though whether he wants them brought to justice or just desires a piece of the pie is not immediately clear. This film is proof-positive that you don’t need much money to make a solid, entertaining film, and the complete lack of pretension to anything else is one of Kansas City Confidential’s charms. The script has some satisfying twists and moments of delicious tension. All the performances are very good, particularly Jack Elam as a twitchy, chain-smoking criminal, Preston Foster as an embittered ex-cop with both a brutal and a soft side, and Payne as a cynical tough guy out for some sort of redemption. The camerawork, particularly in the first half, is striking, with effective use of close-ups and lighting to let the actors act and the dark mood to suffuse the audience. The film’s viewpoint is bleak: The cops are not much better than the criminals, to extent that they are even different people at all. John Payne’s career is almost a noir story in itself. He was originally an upbeat singer and dancer in light-hearted films and was also of course a star of the heartwarming Miracle on 34th Street. But a few years after the war he changed into a tough actor with great physical presence and a clipped style of delivering dialogue. He was very smart about the film business as a business (and shrewdly cleaned up a packet in Hollywood due to wise investments) and may therefore have grasped that the war shifted filmgoers’ taste toward darker movies that would begin to supplant sunnier fare. Whatever the reasons for his transformation, he was very effective both as a smiling song-and-dance man in love with the All-American girl as well as in the hard bitten roles he later took on. Truly, an actor of significant range. 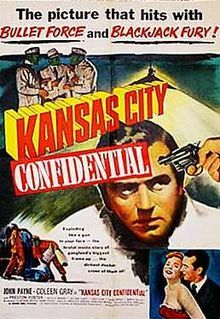 Happily, Kansas City Confidential is in the public domain and you can therefore legally watch it for free here at Internet Archive. I don’t know who wrote that (none of the Microsoft material is attributed), but it sounds plausible. I remember Payne that way–boyish features early, then a hardening as he matured. By the time he had his TV series “Restless Gun” in the late 50s, “hard” was certainly an accurate description of his look and demeanor. I wonder if he also undertook weight training to change his image. He looks pretty powerfully-built in the 1950s after being more slim before the war. Mr. Payne’s shift to different roles may also have been influenced by the experience he had as the celebrity MC at a UCLA student Spring Sing at the Hollywood Bowl in the early fifties. When introduced to the students (some thousands) they responded with, “Who’s he?” My perception of him at that time was that he was a second tier leading man who appeared in romantic films. Certainly, not hard-boiled or tough. He also looked slim and trim. Ouch. Reminds me of Ingrid Bergman getting her hair done a month before her death. She was with an old friend and when she checked in the young girl at the desk asked her name and she said “Ingrid”. The young woman said “Ingrid WHO?”. I saw the old friend tell this story with tears in his eyes. Just watched it because of the recommendation. Nice flick, so thanks! I think Payne has an uncanny resemblance to Kevin Spacey from 10-15 years ago. I can see the Spacey resemblance. Glad you liked the film. You might like next week’s as well — same star/producer/director. Just got around to seeing this on TCM last night….what a great film….also got to see The Crooked Way with Payne in a film noir version of Random Harvest….I love the first line the cops say to Payne when he gets to Union Station after being away 5 years…. "A lot of people thought you were dead….and the ones who didn't wish you were." What a great hello…that's film noir at its best. Payne was certainly a wonderful and versatile actor..I could easily have seen him as Rick in Casablanca…it's too bad he is really only known for one movie….